His Lordship the Honourable Mr. Justice Paul Webster QC has been appointed by the Judicial and Legal Services Commission to act as Justice of Appeal of the Eastern Caribbean Supreme Court for a period of three years effective September 1, 2015. His Lordship will be based in the Territory of the Virgin Islands and will travel throughout the Eastern Caribbean for court sittings. He will preside over appeal cases in the Virgin Islands when required. Mr. Webster was admitted as a Barrister of the Eastern Caribbean Supreme Court in 1980 and brings 35 years of experience to the post. 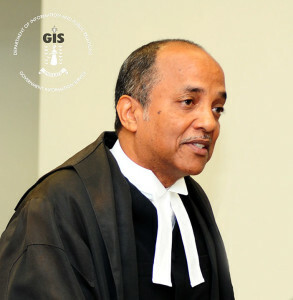 Justice Webster received his Bachelor of Laws from the University of the West Indies in 1978 and a Legal Education Certificate from the Norman Manley Law School in 1980. He has served as legal counsel in the High Court, the Court of Appeal and the Privy Council, and has extensive work experience with practitioners in the Caribbean and the United Kingdom. He acted as a Judge of the Eastern Caribbean Supreme Court in St. Vincent and the Grenadines in 2001, where he presided over the Civil Division of the Court. He has also served as an arbitrator and was appointed as Her Majesty’s Council in 2003. Mr. Webster QC has produced expert reports of BVI law for use in the United States, England, Sweden and Hong Kong. He has also produced 24 written High Court judgments, written 10 Court of Appeal judgments with other justices of appeal, and has delivered at least five oral judgments of the Court of Appeal. Justice Webster served as the President of the Rotary Club of Road Town and served two terms as the President of the BVI Bar Association. He served as the chairman of the Insolvency Committee of the BVI Bar Association and was the Chairman of the BVI Social Security Board from 2013 to 2015. Justice Webster has also served as a Member of the Financial Services Legislative Action Committee, The Law Reform Committee and the Legal Aid Board, in addition to several other committees. He worked with the law firm McWelling Todman and Co. from 1980 to 1990, and was a founding partner and head of the litigation unit of the law firm O’Neal Webster. The Court of Appeal is an itinerant court which hears appeals from the nine Member States and Territories of the Eastern Caribbean Supreme Court.